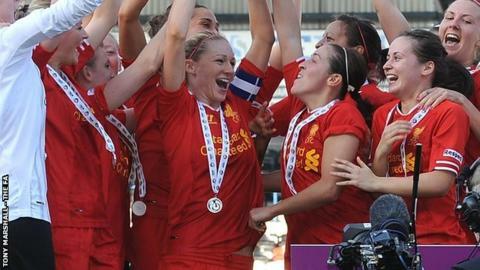 Liverpool begin the defence of their title in the revamped FA Women's Super League on Thursday against newcomers Manchester City. In addition to a top division of eight teams, this season will see a second tier of 10 teams, with promotion and relegation between WSL 1 and 2. WSL 1 begins on Wednesday, with Notts County hosting Arsenal live on BBC Radio and Birmingham facing Everton. Chelsea play last season's runners-up Bristol Academy on Thursday. "It will be tough, the most competitive season yet," Liverpool boss Matt Beard told BBC Sport. "We just want to stay in touch with the top teams and we are looking forward to the challenge." Emma Hayes's Chelsea and others teams are aiming to follow in the path of Liverpool, who won the title last season after recruiting 10 new players and training on a full-time basis. Chelsea have signed eight new players, while Manchester City - backed by the club's wealthy owners - have signed four England internationals. Arsenal, who had won the league the previous nine seasons, will be aiming to improve on third place last year despite only losing one league game. Competition at the bottom of WSL 1 will also be fierce with relegation costing clubs £40,000 of Football Association funding. Birmingham boss David Parker said: "We can't get relegated because of the financial implications and the potential of losing players to WSL 1 teams." Sunderland are tipped to be front runners in WSL 2 as they join the league for the first time, having won the previous second tier for the last three seasons. They will be challenged for promotion by Doncaster Rovers Belles, Aston Villa, Durham, London Bees, Millwall, Oxford United, Reading, Watford and Yeovil. The decision to split the league into two tiers is part of the FA's five-year plan to make women's football the second most-played sport in the country behind men's football. Fourteen games are set to be broadcast live on BT Sport, with 16 games live on BBC Radio 5 live sports extra. Goals round-ups will also be shown on the BBC Sport website. FA director of women's football Kelly Simmons said: "This is a hugely exciting moment for the women's game. The establishment of a second division really demonstrates just what appetite there is from both clubs and supporters for a thriving, entertaining and successful league. "We will have over 100 hours of live coverage this season, which is a fantastic breakthrough for the game. We want to increase attendances to 1,000 fans for most of our games." Doncaster Rovers Belles were demoted from the top flight last season after they failed to meet certain criteria surrounding the financial management and marketing of the club, as well as the quality of support staff and facilities. There is a possibility that the top team in WSL 2 might not be promoted unless they meet these conditions, but the FA said it would work with second division teams to improve their development plans over the course of the season. Wednesday's match between Notts County and Arsenal will be live on BBC Radio 5 live sports extra from 18:30 BST.